Full time mechanic, Vincent Jones, was never in any doubt about his chosen career path. Both his father and grandfather before him, had served as lifeboat crew members and on his 17th birthday Vincent signed the joining papers to signify his commitment to the RNLI. At that stage he had already embarked on a 4 year marine engineer apprenticeship with a Holyhead boatyard and was familiarising himself with lifeboat layout and refits on a regular basis. 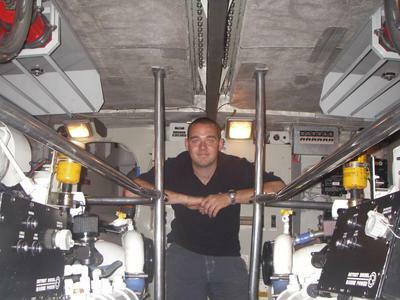 Joining as probationary crew in February 2000, his natural ability shone through and after becoming emergency mechanic, was promoted to full-time mechanic at 19, making him the youngest ever mechanic employed by the RNLI. Although modest about his achievements, this was clearly a great accolade. Vincent’s onshore duties revolve around routine maintenance of both the offshore and inshore lifeboats as well as all launching and life-saving equipment, in addition to general crew training, particularly of his own deputies. It is a regulatory requirement that the all-weather lifeboat has a mechanic on board when called out and Vincent’s chief sea-going duty is as the radio officer. His initial focus is on establishing the circumstances of the call-out including precise location of the casualty and difficulties the crew are likely to encounter. This, in turn, has to be constantly relayed to Coxswain, Anthony Barclay, whilst establishing direct contact with the casualty to provide reassurance. Sometimes problems can be sorted out by radio contact, thus alleviating anxiety and possible further danger. the casualty to be picked up almost instantly. Had they been seconds later, the story could have been a very different one. Witnessing the emotions displayed when returning this extremely fortunate and beholden gentleman to his family, brought home to Vincent, as never before, the true value of “what lifeboatmen do”. Such is his confidence in the boat and Moelfre’s crew, that he has never felt uncomfortable with a situation they have had to encounter and he has 100% belief in their ability to respond effectively to all incidents. His experience on call out to the disabled yacht Annarchy in hurricane force conditions in June 2002 served to reinforce his conviction that when put under extreme pressure, Moelfre RNLI Lifeboat crew is capable of “pulling out all the stops”. On this occasion they rescued two crew members from the Annarchy. Vincent’s role will be further challenged with the arrival of the new Tamar class lifeboat within the next few years. He will step in early in the pre-commissioning phase of the boat to become fully conversant with all the new systems and machinery layout and will assist in ironing out any teething problems. He will then be responsible for training up his deputies. The RNLI expect the Tamar project across the UK to be completed by 2012. In common with the other RNLI lifeboat personnel I have talked to, what impacts on me most is the tremendous dedication, passion, pride and team unity which the crew possess and are central to the challenges they face. In the next edition I’ll be talking to an onshore lifeboat volunteer whose role, although different, is every bit as significant when the Moelfre RNLI lifeboat is launched on “a shout”.